Dr. John H. McClendon III, is Director of African American and African Studies and Professor in the Department of Philosophy at Michigan State University. He holds a Bachelor’s degree in Black Studies and Political Science from Central State University and a Master’s and doctorate in philosophy from the University of Kansas. McClendon has taught at State University of New York at Binghamton, University of Illinois Champaign/Urbana, Eastern Illinois University, the University of Missouri-Columbia and Bates College. McClendon’s areas of expertise include African philosophy, Philosophy of African American Studies, Marxist philosophy, and the history of African American philosophers. He is the author of C.L.R. James’s Notes on Dialectics: Left Hegelianism or Marxism-Leninism (Lexington Books 2005) and several monographs, reports, booklets and articles in noted anthologies. 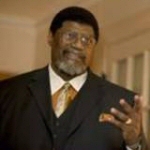 He has published widely in a number of journals including Afro-Americans in New York Life and History, Journal of Speculative Philosophy, Socialism and Democracy, The AME Church Review, Explorations in Ethnic Studies, Sage Race Relations Abstracts, Freedomways, American Philosophical Association Newsletter on Philosophy and the Black Experience, and Ethnic Studies Review among others. He is currently the Editor of the American Philosophical Association Newsletter Philosophy and the Black Experience, he serves on the Editorial Advisory Board of the journal Cultural Logic and is an Ex Officio Member of the Committee on Blacks in Philosophy—American Philosophical Association. McClendon has lectured widely throughout the country and abroad including in Toulouse, France and at the University of Havana in Cuba. Most recently this year, he was the keynote speaker for Black History Month at Mississippi State University, the Charles Phelps Taft lecturer for the 35th anniversary of the African-American Studies Department at the University of Cincinnati and served as a faculty member for the Schomburg-Mellon Humanities Summer Institute.